Northern Territory Youth Week (or NTYW) is an annual celebration of young people across the Territory and involves a range of fun and exciting events and activities. NTYW 2019 will run from Monday 8 April to Thursday 18 April 2019 and the theme is Living in Colour. 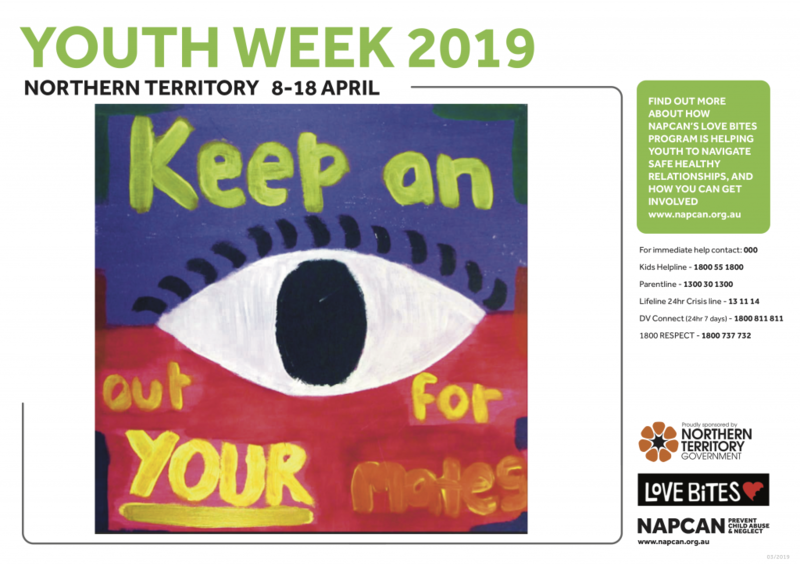 To celebrate Youth Week in the NT, NAPCAN has created a poster showcasing a young person’s artwork completed as part of the Love Bites Respectful Relationships Program in the NT! We also have an NT Youth Week template that can be downloaded for Love Bites communities to insert their own artwork. Youth NT is also running a social media campaign ‘Colours of Our Community’ and will be inviting people to share photos they have taken of their community over NT Youth Week. You can check it out on their Facebook page. There will also be events and activities happening for young people in the Barkly, Central Australia, Darwin, East Arnhem, Katherine and Palmerston regions to celebrate Youth Week. You can view the events through the Office of Youth Affairs in Territory Families calendar, here: http://www.youth.nt.gov.au/calendar.html.